As residents, we know Riverchase is one of the best neighborhoods in Alabama to raise a family and build a life, and now, thanks to local writer Heather Skaggs, others will too! Her new book, Riverchase: Images of Modern America hit bookstores in November. 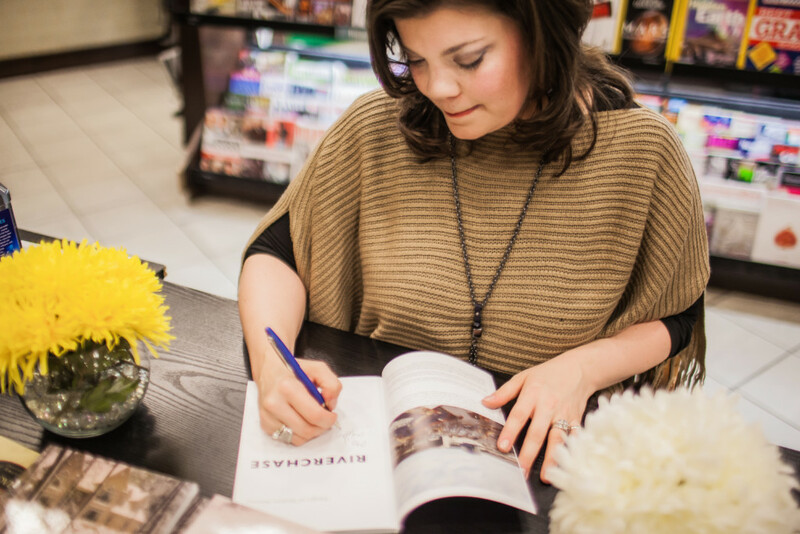 We caught up with Heather at her recent book signing at Barnes & Noble in Patton Creek to discuss her latest work and hear her thoughts on Riverchase. Heather, we are so excited you chose to make Riverchase the subject of your new book! Before we talk about it, can you tell us about some of your previous books? I have been in some form of media most of my adult life. Writing and telling people’s stories is the best part of that. My first book for Arcadia was Images of America Bluff Park in 2012 (it hit bookstores in Feb. 2013). Arcadia found me after seeing my work on Bluffparkal.org. I write history-centered articles for the Bluff Park Neighborhood Website (and now Facebook Page). At the time, several publishers had approached me about doing a book on Bluff Park but they were just not the right fit and the timing was not right. When Arcadia called, it was the right fit and a good time for me to start on the project. After the Bluff Park book came out, Arcadia signed me to a contract for a second book and the topic was the early history of the city of Hoover. Images of America: Hoover came out in October 2014. Bluff Park has been reprinted 5 times by the publisher. Hoover has been reprinted 3 times. So, what made you choose Riverchase as the subject for your new book? Arcadia (who acquired The History Press and its titles last year) again signed me to a contract for a third book and wanted me to look at a new series that they had called Images of Modern America. Modern America focuses on the 1970s to the present day and has around ten photos from each decade. From the time I started on the Hoover book, Riverchase was in the back of my mind but the community itself was not old enough to be its own book in the vintage series (Images of America), and I was short on room in the Hoover book. I proposed a few ideas and we all agreed on Riverchase: Images of Modern America for my third title. The community was supportive and the Riverchase Women’s Club agreed to work with me on the project. How long did it take you to research the book? What were some of your most helpful sources of information? The book writing process takes an average of a year to a year and 6 months. It depends on the contract and the author. Riverchase took a year. I started with the Riverchase information that I had collected while researching my second book (Hoover) and went from there. I met with the Riverchase Women’s Club and mapped out the book and my ideas for the different chapters. The club was instrumental in connecting me with the people and resources inside Riverchase to make the book a reality. I visited, emailed, or talked on the phone with each church in Riverchase. Christ the King had a great deal of early Riverchase material. The Residents of Riverchase Facebook Group provided a great outlet for me to talk to the community, request photos, and connect with others. The Hoover Public Library is always a big help with my book projects as well as the Birmingham Public Library Archives downtown. Across all three books, the City of Hoover, the Hoover Police Department and the Hoover Fire Department have been valuable resources. What was the most interesting thing you learned about Riverchase? The one thing that I did not realize before I started researching was how much detail was in the master plan. The master plan fold-out that is pictured in the book shows so much and the vision for the community. In conducting interviews for the book, what was your favorite story and why? Everyone was very nice and helpful so it is difficult to pick a favorite. A funny story is one of the interviews I did was while my husband and I were on our first Uber ride during a trip to Orlando at Disney. The driver got a short history on Riverchase, and I actually got a good bit of writing done at the Boardwalk Resort where we were staying at Disney World. What would you tell a prospective home buyer who was considering buying a home in Riverchase? Riverchase is a community where you can put down roots. I talked with many residents who grew up in Riverchase and have come home to start their own careers and families here. Riverchase: Images of Modern America is one of the first Alabama books in the modern series for Arcadia. It was an honor to be asked to write for this new series and have one of Hoover’s communities be the first published. What book signings do you have coming up and how can people get a signed copy? I will be presenting a copy of Riverchase to the mayor and council at the November 21st council meeting. This is something I do with each book, and I also donate one to the library. Everyone is invited to come. I will be on ABC 33/40’s Talk of Alabama morning show Dec 1st to discuss the Riverchase book. The following day, I will be at Riverchase Country Club beginning at 6pm to sign copies. Alabama Booksmith will be handling the books for this and people will be able to purchase on site. I will be presenting a copy to Riverchase Elementary School at the December 12th school board meeting. Closer to Christmas, I will be signing at Barnes and Noble again and at Books-A-Million. We encourage all residents to pick up their copy of Heather’s book today! You can give it to a neighbor as a gift, keep a copy for yourself, even put a copy in your guest room so out-of-town guests can read about our neighborhood’s unique story.